Based on the timeless game of ‘twenty-one,’ blackjack is the classic combination of skill, luck and challenge – making it one of the success stories of seamless transition into the world of online gambling. Most versions of the game (and there are many today) are based on what is known as classic blackjack, although specific rules and restrictions apply to individual variants. It is up to the player to read these rules carefully before embarking on any new blackjack game. In blackjack, in an attempt to beat the dealer’s hand, players need to get a combined total of 21 on their dealt cards, without exceeding that number. If they go over the number 21, they go ‘bust’ and lose the game. The winner is the player (or dealer) who manages to get as near to 21 as possible without going bust. The suits of the cards in a blackjack deck are of no consequence and do not influence the card values. All cards keep their own face values, except for the case of Queens, Kings and Jacks, which are valued at 10. The Ace can either count as a 1 or an 11. A traditional blackjack table will typically hold up to six players, all of who play against the dealer. The other players do not influence one another, as they are essentially playing one-on-one with the dealer. All blackjack tables have their own minimum and maximum wagering requirements. Up to eight decks of cards can be used at any given table. 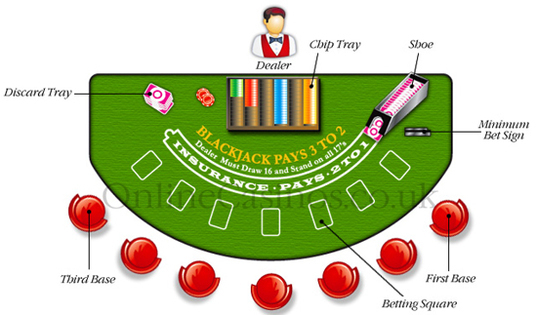 After finding a suitable blackjack table, players need to consider which bets to place. After all bets around the table are placed, the dealer proceeds to hand out two cards each to all the players and then two to himself. In some versions of blackjack, the dealer’s cards are dealt one card up and one card facedown, while in others both cards are dealt face up. Players have the option of making an insurance bet, which essentially means that they bet 2:1 that the dealer has been dealt a blackjack. It is usually recommended to take out this type of bet if the dealer’s up card is an Ace. However, the player can lose this bet if the dealer does not have 21. The next step in blackjack is where the skill element comes in. It is at this point that players need to decide what to do with the two cards that they were dealt, all the time bearing in mind that whatever they choose will affect whether they get nearer than the dealer to 21 or whether they go bust and thus lose the game. This is a choice that the player makes if he is happy with the cards that were dealt to him. By making this decision, the player is saying that he does not want any more cards dealt and will take a risk that the dealer won’t better his card value and get nearer to 21 than himself. By requesting a ‘hit’ from the dealer, the player is asking for another card to be dealt as he feels that his cards are not sufficient to warrant him standing at this point in the game. This option obviously comes with a risk factor attached as the player may very well exceed the number 21 (and thus go bust) if his card’s value is too high. When players are dealt two cards of equal denominations, they may be allowed to split these cards and make two new hands. A bet equal to the player’s initial bet is then placed and a dual hand of blackjack is played out. Not all versions of blackjack allow card splitting, while some allow it under certain conditions only. In classic blackjack, for example, players are usually allowed to split a hand once. This is an option usually chosen by players who feel that they are ahead in the game and are quite confident of their hand. Doubling down means that the player doubles his original bet and, in exchange, is only allowed to be dealt one more card in the process of the game. Just as a strong player might consider doubling down, so too can a player with a weak hand ‘surrender’ his cards at a certain point in the game. However, half of the player’s original bet is forfeited for the act of leaving the game. Again, casinos may place restrictions on surrendering, with not all of them allowing this option. Although rules may differ from casino to casino, it is generally accepted that dealers draw a card if the combined total of their cards is less than 17, and are required to stand if their cards total 17 or more. A dealer needs to act according to the rules of the casino and cannot make his own decisions about when to stand and when to draw a card. It cannot be stressed enough how important it is for players to make a note of the dealer’s requirements as this can affect their basic strategy calculations. As stated before, players will win at blackjack if their cards total 21 (or nearest to 21). An automatic win is when the player is dealt a pure blackjack (ie. a total of 21 in the first two dealt cards). Payout for this hand is one and half times the original wager. Sometimes (although rarely), the dealer will also get a blackjack in the first round of the game – known as a push – and this situation is resolved by the player receiving his original bet back. If players get a higher card count than the dealer, he wins an equal amount to his original bet. Finally, if the dealer goes bust, the player wins the bets. Any side that exceeds 21 automatically goes bust and the other party wins. Casinos Online is not responsible for visitors who use this site for anything other than informative purposes. Online gambling is illegal in some jurisdictions and users must ensure that they consult the relevant authorities to determine their legal status before playing any casino games.